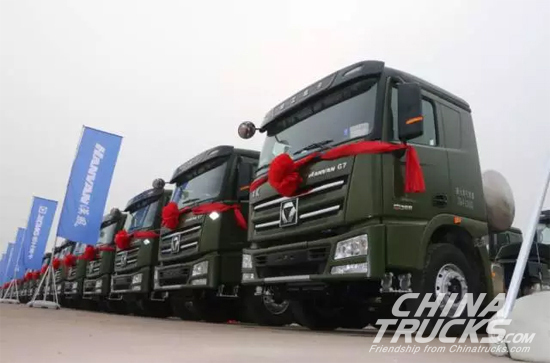 On October 18, as the whole nation welcomed the opening of the 19th National Congress of the Communist Party of China, the delivery ceremony of XCMG Heavy-duty Truck -Jiujiang Logistics to hand over 300 units LNG motor tractors under the theme of “Leading Summit Cooperation and Building Green Steel” was held in Qian’an, Hebei. Yang Dongsheng, general manager and deputy Party secretary of XCMG; Luo Donghai, general manager assistant of XCMG, general manager and Party secretary of XCMG Automotive Division; and Wang Liang, general manager of Jiujiang Logistics Co., Ltd., as well as more than 200 high-end customer representatives from Tangshan, Qinhuangdao, Tianjin, and Yingkou attended the ceremony. 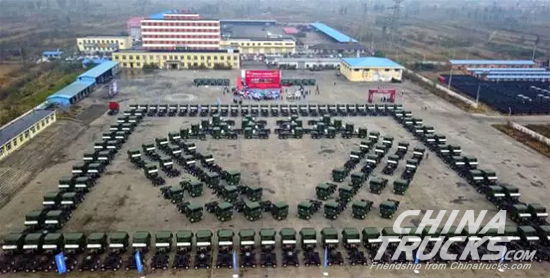 A large steel array of 300 army green HANVAN LNG tractors, arranged in the pattern of XCMG’s logo, was accepted and put into busy operation. At the ceremony, Mr. Luo Donghai and Mr. Wang Liang signed a Long-term Cooperation Strategy Agreement. It was reported that orders of 600 units were placed by other large customers. It is clearly stated in the report of the 19th National Congress of the Communist Party of China that “We should fight to build our country into a prosperous, democratic, civilized, harmonious, and beautiful socialist modern and strong state.” As the mainstay in the Chinese industrial sector and a pillar of the country, XCMG always pursues the ambition of “serving the country through industrial development. It constantly leads the industry to reach new highs and uses new technologies and new products to boost economic development and beautifies the living environment. 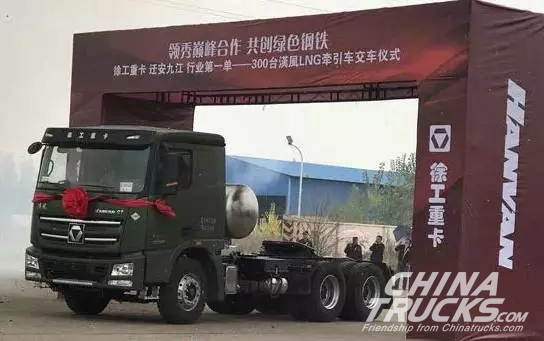 The delivery of 300 LNG heavy trucks was a great gift for the 19th National Congress of the Communist Party of China.